A ring cairn of 25 stones may be all that remains of a burial mound dating to about 1500 BC. The cairn holds a burial cist, and is thought to be the largest in Wales. What makes Carn Llechart so striking is that the kerb stones have been arranged at an outward angle to create a 'crown of thorns' effect. In the centre of the cairn is a cist, or box formed of small stone slabs. The cist was originally topped by a large stone slab, but this has been lost. The cist was originally covered by a large cairn, or mound of earth. Another interpretation is that there was never an earth mound, but the stone 'circle' was in fact a place of ritual observance itself. This theory gains some weight because there is no obvious evidence of a covering cairn. Aubrey Burl, the prolific writer on prehistoric sites, theorised that ring cairns were a precursor to stone circles. A more modern interpretation is just the opposite; that ring cairns like Carn Llechart were inspired by stone circles, and local inhabitants began to add standing stones around the base of the burial cairns to emulate a fashion for stone circles begun in other regions. In 1695 antiquarian William Camden mentioned the cairn in his volume 'Britannia', one of the earliest antiquarian books. Camden described the cairn as 'a circle of rude stones, which are somewhat of a flat form'. He also mentions an entrance, about 4 feet wide, but there is no evidence that an entrance ever existed. He also says the largest stone is less than a yard high, but the tallest stone we see today is almost 8 feet tall. 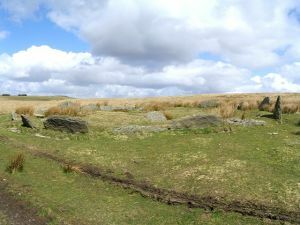 Carn Llechart is one of the largest ring cairns in Wales, measuring 40 feet across, but there is no obvious entry to the circle. We do not know exactly when it was built but a date in the 2nd millennium BC seems likely. The cairn is near a Neolithic burial chamber and several Bronze Age cairns. Car Llechart hit the news in 2004 when a pair of psychic investigators reported becoming ill after visiting the site. The pair speculated that there was a form of energy field at the cairn that affected them. One theory seems to be that there is a sulphur spring beneath the cairn, and that somehow affected the investigators. But you don't need to believe (or disbelieve) in psychic phenomena to enjoy visiting the site and wonder why it was built! The cairn is located beside a track linking a pair of long distance footpaths; the Cwm Clydach Walk and the St Illtyd's Walk. Access is off Barran Road, north west of Rhyd-y-Fro village on the way to Ammanford. An OS map is a necessity for finding the cairn!